Organometallic compounds are organic compounds incorporating carbon-metal bonds. Organometallic compounds have been known and studied for nearly 200 years, and their unique properties have been widely used in synthetic transformations. Depending on the reduction potential of the metal, the reactivity of organometallic compound can vary greatly. The most reactive compounds require low to moderate temperatures and inert conditions (atmosphere and solvents) for preparation and use and the highly reactive compounds can be pyrophoric. 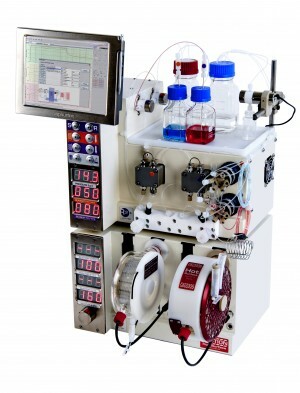 Continuous flow chemistry is an excellent tool for undertaking reactions utilising organometallic reagents for many reasons; precise control of reaction temperature, time and mixing, low volume sealed system so easily maintained dry and inert, efficient to keep continuous reactors cool when compared with batch reactors, improved safety through lower inventory of hazardous materials and handling of pyrophoric reagents eliminated. 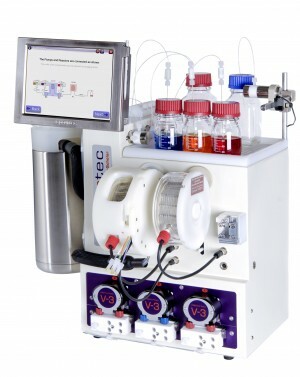 This application note illustrates the use of the Vapourtec E-Series system to run reactions such as Grignard reactions under continuous flow conditions for extended periods with no pump issues. This application note illustrates the use of the Vapourtec E-Series system to run organometallic reagents such as n-Butyl lithium under continuous flow conditions. This application note demonstrates the preparation of arene chromium tricarbonyl complexes using continuous-flow processing: (η6C6H5CH3)Cr(CO)3 as an example.